American Herring Gull (smithsonianus) 25J 1st cycle (1CY), December 31 2016, Coney Island Beach. Picture: Clemens Gasser. Please also visit: Gulls of Appledore Isl. and Clemens's Flickr site. "Green 25J was banded as a chick at nest 16H10 on Appledore Island in Maine. The banding date was July 15, 2016. The nest was located at the steps to a dormitory of Shoals Marine Lab with frequent travel past the nest. This report is the second report received for 25J since leaving Appledore Island. The first report was in September 9, 2016 at Seabrook Beach in New Hampshire. This report from Coney Island indicates a southward movement. 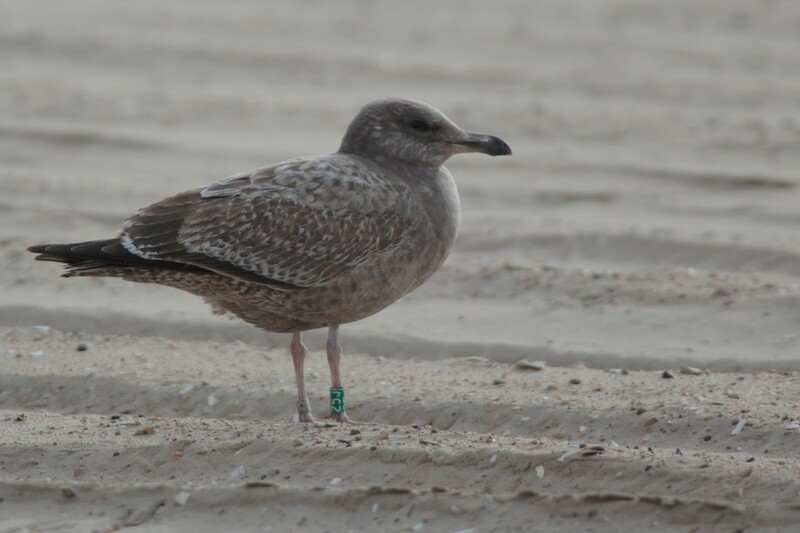 Some Herring Gulls from Appledore have moved as far south at Texas and Florida so we hope for additional reports on 25J to see if the gull stays about the NY area or continues south" reported back by Appeldore volunteer Bill Clark. All scaps replaced. All coverts, tertials, and all visible fight feathers still juvenile. Underparts and head are a combination of older retained juvenile feathers (now faded pale brown) and several new darker grey feathers, onwhich markings are well demarcated.